Grantland's Mark Harris is an avid spokesperson for "prestige" films (my words, not his)- films focusing on story-telling and characters and art versus big budget epic blockbusters that would rather replace CGI with its script in order to rake in massive amounts of dough. While I do share Harris' love of a good prestige film, I also can't say I share Harris' dislike of big budget actions films as well. I love a good summer movie when it's done well. Most recently we received The Dark Knight, Edge of Tomorrow, and Mad Max: Fury Road thanks to Hollywood's love of capitalizing on the summer season and I don't want to live in a world without those films. The summer of 2015 hasn't given us a shortage of money-making epics leading off with Furious 7, bouncing to Avengers: Age of Ultron, and now leading the pack (and the world) is Jurassic World. But in a season where Hollywood (mainly Universal Studios) is looking at its pile of money like its Scrooge McDuck about to nose dive into a pile of gold coins, the winner of the summer season is a little Indie that could. Well, winner is a relative term. Jurassic World and Chris Pratt are obviously the true winner, but in terms of quality film making, Dope is the best film you'll see this summer. Dope is a film written and directed by Rick Famuyiwa- a man who's credits before this looks like a grocery list. It premiered at Sundance, and thanks to Open Road films, Dope was released domestically as counter-programming to the big budget action flicks. Considering Open Road bought the film for a little over 3 million and it's already grossed over 14, it was money well spent. And I personally thank Open Road (and Sony) to give me ability to watch a film this good. 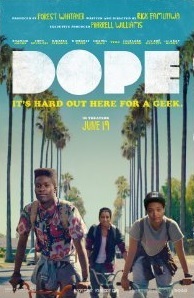 Dope follows around high school seniors Malcolm (Shameik Moore) and his two best friends Jib (Tony Revolori aka the young Indian boy from The Grand Budapest Hotel) and Diggy (Kiersey Clemons)- self-proclaimed Black nerds who love 90's hip-hop and live in the poorest of poor neighbors in Southern California. All three are smart and Malcom has realistic ambitions of attending Harvard and getting out of the ghetto. These three do everything together: they play in a rock band called Awreeo (pronounced "Oreo"), they hit on girls together, they study together, and they get beat up together.